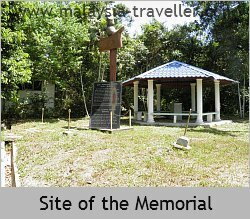 If you search Google Images for Kuala Klawang Memorial (or its Bahasa name, Batu Peringatan Inggeris) you will see photos of various monuments and places but almost none of them are of the actual correct memorial. This suggests that not many people have made the effort to visit it. To be fair it is not very well sign-posted although it is easy to find if you know where it is (see below). 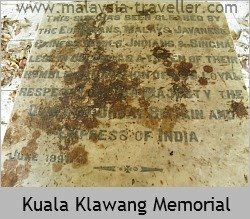 "This site has been cleared by the Europeans, Malays, Javanese, Chinese, Tamils, Indians & Singhalese in Jelebu as a token of their humble admiration of, and loyal respect to, Her Majesty the Queen of Great Britain and Empress of India. June 1897"
June 1897 was the date of Queen Victoria's Diamond Jubilee so this plaque must have been erected by the residents of Kuala Klawang to celebrate her 60 years as monarch. 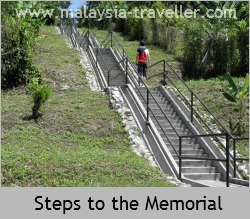 The Memorial is located on top of a small hill, Bukit Undang, from where there is a good view over the town although the view is mostly obstructed by trees. Also on the hill top is an old water tank, with a sign indicating that it holds 38,600 gallons. 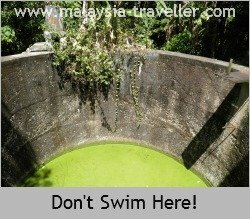 It is filled with some of the murkiest, vivid green water that you could imagine. 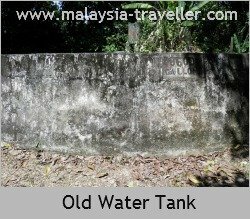 This water tank could be responsible for the vast numbers of mosquitoes which were infesting the hill top during my visit. Better not to linger too long here. 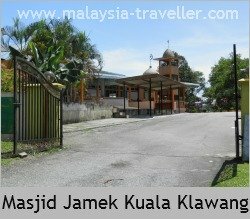 Head for the nearby Kuala Klawang Adat Museum instead which is much more interesting. 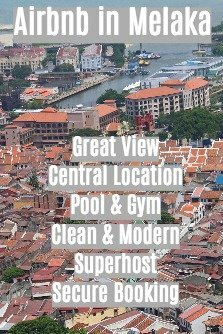 Look for the Kuala Klawang police station which is off to the left as you arrive in the town centre from the Seremban direction. Just past the police station is a turning left which leads uphill to a mosque, Masjid Jamek, just behind and above the police station. You can park outside the mosque and you will see a flight of steps which leads to the memorial. 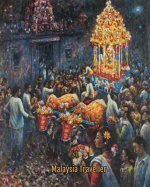 Return from Kuala Klawang Memorial to Top Negeri Sembilan Attractions .